Caracalla (/ˌkærəˈkælə/; 4 April 188 – 8 April 217), formally Marcus Aurelius Severus Antoninus Augustus, was the Roman emperor from AD 198 to 217. A member of the Severan Dynasty, he was the eldest son of Septimius Severus and Julia Domna. Caracalla reigned jointly with his father from 198 until Severus' death in 211. For a short time Caracalla then ruled jointly with his younger brother Geta, with whom he had a sour relationship, and whom Caracalla had murdered later in 211. Caracalla's reign was marked by domestic instability and external invasions from the Germanic people. Caracalla's reign was notable for the Antonine Constitution (Latin: Constitutio Antoniniana), also known as the Edict of Caracalla, which granted Roman citizenship to nearly all freemen throughout the Roman Empire. The edict gave all the enfranchised men Caracalla's adopted praenomen and nomen: "Marcus Aurelius". Domestically, Caracalla was known for the construction of the Baths of Caracalla, the second largest bath in Rome, for the introduction of a new Roman currency, the antoninianus, a sort of double denarius, and for the massacres he enacted against the people of Rome and elsewhere in the empire. Towards the end of his rule, Caracalla began a campaign against the Parthian Empire, a campaign he did not see through to completion due to his assassination by a disaffected soldier in 217. He was succeeded as emperor by Macrinus after two or three days. Caracalla is presented in ancient sources as a tyrant and cruel leader, an image which has survived into modernity. Cassius Dio and Herodian present Caracalla as a soldier first and emperor second. In the 12th century, Geoffrey of Monmouth started the legend of Caracalla's role as the king of Britain. Later in the 18th century, Caracalla's memory was revived in the works of French artists due to the parallels between Caracalla's apparent tyranny and that of King Louis XVI. Modern portrayal of Caracalla is that of a psychopathic and evil ruler who was among the worst of Roman emperors. Caracalla was born Lucius Septimius Bassianus. He was renamed Marcus Aurelius Antoninus at the age of seven as part of his father's union with the families of Antoninus Pius and Marcus Aurelius. According to Aurelius Victor in his Epitome de Caesaribus, he became known by the agnomen "Caracalla" after a Gallic hooded tunic which he habitually wore and made fashionable. He may have begun wearing it during his campaigns on the Rhine and Danube. Dio Cassius generally referred to him as Tarantus, after a famously diminutive and bloodthirsty gladiator of the time. Caracalla was born in Lugdunum, Gaul (now Lyon, France), on 4 April 188 to Septimius Severus and Julia Domna. He had a slightly younger brother, Geta, who would briefly rule as co-emperor alongside him. Caracalla's father, Septimius Severus, appointed Caracalla joint Augustus and full emperor from the year 198 onwards. His brother Geta was granted the same title, Augustus, in 210. In 202, Caracalla was forced to marry the daughter of Plautianus, Fulvia Plautilla, a woman whom he hated, though for what reason is unknown. By 205, Caracalla had succeeded in having Plautianus executed for treason, though he had probably fabricated the evidence of the plot himself. It was then that he banished his wife, whose later killing might have been completed under Caracalla's orders. Caracalla's father, Septimius Severus, died on 4 February 211 at Eboracum (now York) died while on campaign in Caledonia, north of the Roman Britannia. Caracalla and his brother, Publius Septimius Antoninus Geta, jointly inherited the throne upon their father's death. Caracalla and Geta ended the campaign in Caledonia after concluding a peace with the Caledonians which returned the border of Roman Britain to the line demarcated by Hadrian's Wall. During the journey back to Rome with their father's ashes, Caracalla and his brother continuously argued with one another, making relations between them increasingly hostile. Caracalla and Geta considered dividing the empire in half along the Bosphorus, Caracalla to rule in the west and Geta to rule in the east, to make their co-rule less hostile.They were persuaded not to do this by their mother. Then on 26 December 211 at a reconciliation meeting arranged by their mother Julia Domna, Caracalla had Geta assassinated by members of the Praetorian Guard loyal to himself, leading to Geta dying in his mother's arms. Caracalla then persecuted and executed most of Geta's supporters and ordered a damnatio memoriae pronounced by the Senate against his brother's memory. Geta's image was removed from all paintings, coins were melted down, statues were destroyed and his name was struck from papyrus records and it became a capital offence to speak or write Geta's name. In the aftermath of the damnatio memoriae, an estimated 20,000 people were massacred. Those killed were Geta's inner circle of guards and advisors, friends and other military staff under his employ. Among those killed were the son of Pertinax - Helvius Pertinax - and Marcus Aurelius' last remaining daughter - Annia Cornificia Faustina Minor. Caracalla left the capital in 213, about a year after the murder of Geta, and spent the rest of his reign in the provinces, particularly those of the East. The Senate and other wealthy families were kept in check by forcing them to construct, at their own expense, palaces, theaters, and places of entertainment throughout the periphery. New and heavy taxes were levied against the bulk of the population, with additional fees and confiscations targeted at the wealthiest families. 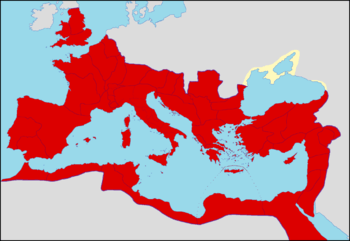 The Roman Empire during the reign of Caracalla. In 213, Caracalla went north to the German frontier to deal with the Alamanni and Goths tribesmen, a confederation of migrating Germanic tribes who had broken through the limes in Raetia. During the campaign of 213–214, Caracalla successfully defeated some of the Germanic tribes while settling other difficulties through diplomacy. While there, Caracalla strengthened the frontier fortifications of Raetia and Germania Superior, collectively known as the Agri Decumates, such that it was able to withstand further barbarian invasions for another twenty years. Gibbon compares Caracalla to emperors such as Hadrian who spent their careers campaigning in the provinces and then tyrants such as Nero and Domitian whose entire reigns were confined to Rome and whose actions only impacted upon the senatorial and equestrian classes residing there. Gibbon then concludes that Caracalla was "the common enemy of mankind", as both Romans and provincials alike were subject to "his rapine and cruelty". After Caracalla concluded his campaign against the Alamanni it became evident that he was inordinately preoccupied with the Greek-Macedonian general and conqueror Alexander the Great. He began openly mimicking Alexander in his personal style. In planning his invasion of the Parthian Empire, Caracalla decided to equip the men of his army of 16,000 men in the style of Macedonian phalanxes, despite the Roman army having made the Phalanx an obsolete tactical formation. Christopher mentions that the term Phalangarii has two possible meanings both with military connotations, the first refers merely to the Roman battle line and does not specifically mean that the men were armed with pikes, and the second bears similarity to the 'Mariam Mules' of the late Roman Republic who carried their equipment suspended from a long pole, which were in use until at least the 2nd century A.D. As a consequence, the Phalangarii of Legio II Parthica may not have been pikemen, but rather standard battle line troops or possibly Triarii. Caracalla's mania for Alexander went so far that, Caracalla visited Alexandria while preparing for his Persian invasion and persecuted philosophers of the Aristotelian school based on a legend that Aristotle had poisoned Alexander. This was a sign of Caracalla's increasingly erratic behaviour. But this mania for Alexander, strange as it was, was overshadowed by subsequent events in Alexandria. When the inhabitants of Alexandria had heard of Caracalla's claims that he had killed his brother Geta in self-defence, they produced a satire mocking this as well as Caracalla's other pretensions. In 215, Caracalla travelled to Alexandria and savagely responded to this insult by slaughtering the deputation of leading citizens who had unsuspectingly assembled before the city to greet his arrival, and then unleashed his troops for several days of looting and plunder in Alexandria. Following the massacre at Alexandria, Caracalla moved east onto Armenia and by 216 he had pushed through Armenia and south into Parthia. During the reign of Septimius Severus, Julia Domna played a prominent public role, receiving titles of honor such as "Mother of the camp" but she also played a role behind the scenes helping Septimius administer the empire. Described as ambitious, Julia Domna surrounded herself with thinkers and writers from all over the empire. While Caracalla was mustering and training troops for his planned Persian invasion, Julia remained in Rome, administering the empire. Julia's growing influence in state affairs was the beginning of a trend of Emperors' mothers having influence, which continued throughout the Severan dynasty. When Geta had died in 211, her responsibilities increased as Caracalla found administrative tasks to be mundane. She may have taken upon one of the more important civil functions of the emperor; receiving petitions and answering correspondences. The extent of her role in this position, however, is likely overstated. She may have represented her son and played a role in meetings and answering queries, however, the final authority on these legal matters was Caracalla. When Caracalla was murdered, Julia was in Antioch sorting out correspondences, removing unimportant messages from the bunch so that when Caracalla returned, he would not be overburdened with duties. The emperor filled all of the roles in the legal system as judge, legislator and administrator. During his reign as emperor, Caracalla raised the annual pay of an average legionary from 2000 sesterces (500 denarii) to between 2700-3000 sesterces (675-750 denarii). He lavished many benefits on the army, which he both feared and admired, as instructed by his father, Septimius Severus, who had told him and Geta on his deathbed to always mind the soldiers and ignore everyone else. Caracalla needed to gain and keep the trust of the military, and did so with generous pay raises and popular gestures. Caracalla spent much of his time with the soldiers, so much so that he began to imitate their dress and had the manners of a common soldier. 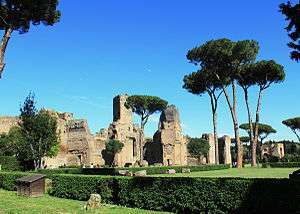 The Baths of Caracalla were under construction from 211 to 216 when a partial inauguration of the baths took place. The outer perimeter of the baths, however, were not completed until the reign of Severus Alexander. These large baths were typical of Roman practice of building complexes for social and state activities in large densely populated cities. The baths covered around 50 acres (or 202,000 square meters) of land and could accommodate 1,600 bathers at any one time. They were the second largest public baths built in ancient Rome and were complete with swimming pools, exercise yards, a stadium, steam rooms, libraries, meeting rooms, fountains and other amenities, all of which were enclosed within formal gardens. Internally it was lavishly decorated with colourful marble floors, columns, mosaics and colossal statuary. At the outset of his reign, Caracalla declared divine support for Egyptian deity Serapis - a god of healing. The Iseum et Serapeum in Alexandria was apparently renovated during Caracalla's co-rule with his father Septimius Severus. The evidence for this exists in two inscriptions found near to the temple which appear to bear their names. Additional archaeological evidence exists for this in the form of two Papyrii that have been dated to the Severan period and two statues associated with the temple which have been dated to around 200 A.D. Upon Caracalla's ascension to sole ruler in 212, the imperial mint began striking coins bearing Serapis' image, a reflection of the god's central role Caracalla's reign. After Geta's death, the weapon which killed him was dedicated to Serapis by Caracalla, most likely to cast Serapis as Caracalla's protector from treachery. Caracalla also erected a temple on Quirinal Hill in 212, which he dedicated to Serapis. A fragmented inscription found in the church of Sant' Agata dei Goti in Rome records the construction, or possibly restoration, of a temple dedicated to the god Serapis. The inscription bears the name "Marcus Aurelius Antoninus", a reference to either Caracalla or Elagabalus. It is more likely referring to Caracalla due to his known strong association with the god. Two other inscriptions dedicated to Serapis were also found in the area around Quirinal Hill as well as a granite crocodile similar to one discovered at the Iseum et Serapeum. The Constitutio Antoniniana (lit. "Constitution of Antoninus" - also called "Edict of Caracalla" or "Antonine Constitution") was an edict issued in 212 by Caracalla which declared that all free men in the Roman Empire were to be given full Roman citizenship with the exception of the dediticii, who were people who had become subject to Rome through surrender in war and also certain people who were freed slaves. Whether the dediticii we truly excepted from the decress is a matter of debate. Before 212, the majority of Roman citizens were inhabitants of Roman Italia, with about 4–7% of all peoples in the Roman empire being Roman citizens by the death of Augustus in 14 AD. Outside Rome, citizenship was restricted to Roman colonia[lower-alpha 1], Romans - or their descendants - living in the provinces, the inhabitants of various cities throughout the Empire, and small numbers of local nobles - such as kings of client countries - held full citizenship also. Provincials, on the other hand, were usually non-citizens, although some Magistrates and their families and relatives held the Latin Right[lower-alpha 2]. One purpose for Caracalla issuing the edict is contended by Dio to have been the desire to increase state revenue; at the time Rome was in a difficult financial situation and needed to pay for the new pay raises and benefits conferred on the military. The edict widened the obligation for public service and gave increased revenue through the inheritance and emancipation taxes which, at the time, only had to be paid by Roman citizens. The provincials also benefited from this edict because they were now able to think of themselves as equal partners to the Romans in the empire. However, few of those that gained citizenship were wealthy, and while Rome was in a difficult financial situation due to the spending of Caracalla and his father on the army, this could not have been the sole purpose of the edict. Another purpose for issuing the edict, as described within the papyrus upon which part of the edict was inscribed, was to appease the gods who had delivered Caracalla from conspiracy. The conspiracy in question was in response to Caracalla's murder of Geta and the subsequent slaughter of his followers, fratricide would only have been condoned if his brother had been a tyrant. The damnatio memoriae against Geta and the large payments Caracalla had made to his own supporters were to protect himself from repercussion. After this had succeeded Caracalla felt the need to repay the gods of Rome by returning the favour to the people of Rome through a similarly grand gesture. This was done through the granting of the citizenship. Other purposes to issuing the edict included the fact that the periphery of the empire was now becoming central to it existence and possibly that this was the logical outcome of Rome's continued expansion of citizenship rights. The expenditures that Caracalla had through the large bonuses he gave to soldiers prompted him to debase the coinage soon after his ascension. At the end of Severus' reign and early into Caracalla's the roman denarius had an approximate silver purity of around 55% but by the end of his reign the purity of a denarius had been reduced to about 51%. In 215 Caracalla introduced the antoninianus, a coin which was intended to serve as a double denarius. This new currency, however, had a silver purity of about 52% for the period between 215 and 217 and an actual size ratio of 1 antoninianus to 0.634 denarii. This in effect made the antoninianus equal to about 1.5 denarii. The reduced silver purity of the coins caused people to hoard the old coins that had higher silver content purity which made the inflation problem caused by the devaluing of the denarii worse than it already was. In 216, Caracalla pursued a series of aggressive campaigns in the east against the Parthians, designed to bring more territory under direct Roman control. He offered the king of Parthia, Artabanus V of Parthia, a marriage proposal between himself and the king's daughter. Artabanus refused the offer, realizing that the proposal was merely an attempt to unite the kingdom of Parthia under the control of Rome. In response, Caracalla used the opportunity to start a campaign against the Parthians and in the summer Caracalla began to attack the countryside east of the Tigris in the Parthian war of Caracalla. In the winter, Caracalla retired to Edessa, modern Şanlıurfa in south-east Turkey, and began making preparations to renew the campaign by spring. At the beginning of 217, Caracalla was at Edessa with a large army preparing to start a new invasion of Parthia. On 8 April 217, Caracalla was travelling to visit a temple near Carrhae, now Harran in southern Turkey, where in 53 B.C. the Romans had suffered a defeat at the hands of the Parthians. After stopping briefly to urinate, Caracalla was approached by a soldier, Justin Martialis, and stabbed to death. Martialis had been incensed by Caracalla's refusal to grant him the position of Centurion, and the Praetorian Guard Prefect Macrinus, Caracalla's successor, saw the opportunity to use Martialis to end Caracalla's reign. In the immediate aftermath of Caracalla's death, his murderer, Martialis, was himself killed by one of the Scythian archers present. After two or three days, Macrinus declared himself emperor with the support of the Roman army. Caracalla's official portraiture as sole emperor marks a break from the detached images of the philosopher-emperors who preceded him: his close-cropped haircut is that of a soldier, his pugnacious scowl a realistic and threatening presence. This rugged soldier-emperor iconic archetype was adopted by most of the following emperors who were dependent on the support of the troops to rule the empire, such as Maximinus Thrax. Herodian describes Caracalla as having preferred Northern European clothing, Caracalla being the name of the short Gaulish cloak that he made fashionable, and often wore a blond wig. Cassius Dio mentions that Caracalla, when he was a boy, had a tendency to show an angry or even savage facial expression. The way Caracalla wanted to be portrayed to his people can be seen through the many surviving busts and coins. Images of the young Caracalla cannot be well distinguished from his younger brother Geta. On the coins Caracalla was shown with laureate since becoming Augustus in 197 while Geta is bareheaded until himself becoming Augustus in 209. Between 209 and their father's death in February 211 both brothers are shown as mature young men, ready to take over the empire. Between the death of the father and the assassination of Geta towards the end of 211 Caracalla's portrait remains static with a short full beard, while Geta develops a long beard with hair strains like his father, a strong indicator for Geta's effort to be seen as the true successor to their father, an effort that came to naught when he was murdered. Caracalla's presentation on coins during the period of co-reign with his father, from 198 to 210, are in broad terms in line with the third-century imperial representation in general; most coin types communicate military and religious messages with other coins giving messages of saeculum aureum and virtues. During Caracalla's sole reign, from 212 to 217, a significant shift in representation took place. The majority of coins produced during this period made associations with divinity or had religious messages, others had non-specific and unique messages which only circulated during Caracalla's sole rule. Caracalla was not subject to a proper damnatio memoriae after his assassination; while the Senate disliked him, his popularity with the military prevented Macrinus and the Senate from openly declaring him to be a hostis. Macrinus, in an effort to placate the Senate, instead ordered the secret removal of statues of Caracalla from public view. After his death, the public made comparisons between him and other condemned emperors and called for the horse race celebrating his birthday to be abolished and for gold and silver statues dedicated to him to be melted down. These events were, however, limited in scope; most erasures of his name from scriptures were either accidental or done through re-use. Macrinus had Caracalla deified and commemorated on coins as Divus Antoninus. There does not appear have been any intentional mutilation of Caracalla in any images that were created during his reign as sole emperor. Caracalla is presented in the ancient sources of Cassius Dio, Herodian and the Historia Augusta as a cruel tyrant and savage ruler. This portrayal of Caracalla is only further supported by the murder of his brother Geta and the subsequent massacre of Geta's supporters that Caracalla enacted. Alongside this, these contemporary sources present Caracalla as a "soldier-emperor" for his preference of the soldiery over the senators, a depiction which made him even less popular with the senatorial biographers. Dio explicitly presented Caracalla as an emperor who marched with the soldiers and behaved like a soldier, and as having large military expenditures and subsequent financial problems. These traits dominate Caracalla's image in the surviving classical literature. The Baths of Caracalla are presented in classical literature as unprecedented in scale, and otherwise impossible to build if not for the use of reinforced concrete. The Edict of Caracalla, issued in 212, however, goes almost unnoticed in classical records. The Historia Augusta is considered by historians as the least trustworthy for all accounts of events, historiography and biographies among the ancient works full of fabricated materials and sources. The works of Herodian of Antioch are by comparison "far less fantastic" than the stories presented by the Historia Augusta. Historian Andrew G. Scott suggests that Dio's work is frequently considered the best source for this period. However, Doctor and Professor Clare Rowan questions Dio's accuracy on the topic of Caracalla, citing his work as presenting a hostile attitude towards Caracalla and thus needing to be treated with caution. 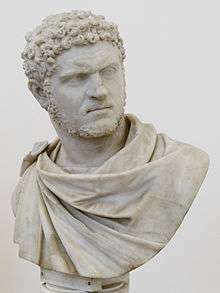 An example of this hostility is found in one section where Dio notes that Caracalla is descended from three different races and that he managed to combine all of their faults into one person: the fickleness, cowardice and recklessness of the Gallic, the cruelty and harshness of the Africans, and the craftiness that is associated with the Syrians. Despite this, the outline of Dio's events are described by Rowan as generally accurate, while the motivations that Dio suggests are of questionable origin. An example of this is his presentation of the Edict of Caracalla, the motive that Dio appends to this event is to increase tax revenue, Doctors Olivier Hekster, Nicholas Zair and Rowan challenge this assertion as the majority of people enfranchised by the edict would have been poor. Rowan, in her work, also describes Herodian's depiction of Caracalla: more akin to a soldier than an emperor. Geoffrey of Monmouth's legendary History of the Kings of Britain makes Caracalla a king of Britain, referring to him by his actual name "Bassianus", rather than the nickname Caracalla. In the story, after Severus' death the Romans wanted to make Geta king of Britain, but the Britons preferred Bassianus because he had a British mother. The two brothers fought a battle in which Geta was killed and Bassianus succeeded to the throne. He ruled until he was betrayed by his Pictish allies and overthrown by Carausius, who, according to Geoffrey, was a Briton, rather than the historically much later Menapian Gaul that he actually was. Caracalla's memory was revived in the art of late eighteenth-century French painters. His tyrannical career became the subject of the work of several French painters such as Greuze, Julien de Parme, David, Bonvoisin, J.A.C. Pajou, and Lethière. Their fascination with Caracalla was a reflection of the growing discontent of the French people with the French monarchy. Caracalla's visibility was influenced by the existence of several literary sources in French; this included both translations of ancient works and contemporary works of the time. Caracalla's likeness was readily available to the painters due to the distinct style of his portraiture and his unusual fashion, more akin to a soldier than emperor, which distinguished him from other emperors. The artworks may have served as a warning that absolute monarchy could become the horror of tyranny and that disaster could come about if the regime failed to reform. Arts Historian Susan Wood suggests that this reform was for the absolute monarchy to become a constitutional monarchy, as per the original goal of revolution, rather than the republic which it eventually became. Wood also notes the comparable similarity between Caracalla and his crimes leading to his assassination and the eventual uprising against and death of King Louis XVI, both had died for their apparent tyranny. Caracalla has had a reputation that marks him as being among the worst of Roman emperors, this perception of Caracalla survives into modern works. Arts and linguistics historian John Agnew and writer Walter Bidwell describe Caracalla as having an evil spirit, referring to the devastation he wrought in Alexandria. Roman Historian David Magie describes Caracalla, in the book Roman Rule in Asia Minor, as brutal and tyrannical pointing towards psychopathy for his behaviour. Historian Edward Gibbon, author of The History of the Decline and Fall of the Roman Empire, takes Caracalla's reputation, which he had received for the murder of Geta and subsequent massacre of Geta's supporters, and applies it to Caracalla's provincial tours suggesting that "every province was by turn the scene of his rapine and cruelty". This representation is questioned by historian Shamus Sillar who cites the construction of roads and reinforcement of fortifications in the western provinces among other things as being contradictory to the representation made by Gibbon of cruelty and destruction. History professors Molefi Asante and Shaza Ismail note that Caracalla is known for the disgraceful nature of his rule, stating that "he rode the horse of power until it nearly died of exhaustion" and that though his rule was short, his life, personality and acts made him a notable, though likely not beneficial, figure in the Roman Empire. ↑ Colonia are cities of Roman citizens made built in conquered provinces. Non-roman's living in Colonia were allowed to become citizens when they accepted the rule of Rome. ↑ The Latin Rights or ius Latinii were an intermediate or probationary stage for non-Roman's obtaining full Roman Citizenship. Aside from the right to vote, and ability to pursue a political office, the Latin Rights was just a limited Roman Citizenship. 1 2 3 4 5 6 Dunstan, William, E. (2011). Ancient Rome. Lanham: Rowman and Littlefield. pp. 210–211. ISBN 978-0-7425-6832-7. 1 2 3 Gagarin, Michael (2009). Ancient Greece and Rome. Oxford University Press. p. 51. 1 2 3 4 5 6 7 8 Goldsworthy, Adrian (2009). How Rome Fell: death of a superpower. New Haven: Yale University Press. p. 74. ISBN 978-0-300-16426-8. ↑ Encyclopaedia Britannica, Ninth Edition. New York: Charles Scribner's Sons. 1878. p. 81. ↑ Dunstan, William, E. (2011). Ancient Rome. Lanham: Rowman and Littlefield. p. 103. ISBN 978-0-7425-6832-7. ↑ Grant, Michael (1996). The Severans: the Changed Roman Empire. Psychology Press. p. 19. 1 2 3 4 Dunstan, William, E. (2011). Ancient Rome. Lanham: Rowman and Littlefield. p. 210. ISBN 978-0-7425-6832-7. 1 2 3 Dunstan, William, E. (2011). Ancient Rome. Lanham: Rowman and Littlefield. p. 206. ISBN 978-0-7425-6832-7. 1 2 3 Goldsworthy, Adrian (2009). How Rome Fell: death of a superpower. New Haven: Yale University Press. pp. 68–69. ISBN 978-0-300-16426-8. 1 2 3 Goldsworthy, Adrian (2009). How Rome Fell: death of a superpower. New Haven: Yale University Press. p. 70. ISBN 978-0-300-16426-8. 1 2 3 Goldsworthy, Adrian (2009). How Rome Fell: death of a superpower. New Haven: Yale University Press. pp. 70–71. ISBN 978-0-300-16426-8. 1 2 Varner, Eric, R. (2004). Mutilation and transformation: damnatio memoriae and Roman imperial portraiture. Brill Academic. p. 168. ISBN 90-04-13577-4. ↑ Gibbon, Edward (1776). The History of the Decline and Fall of the Roman Empire. p. 172. 1 2 3 4 5 6 7 Dunstan, William, E. (2011). Ancient Rome. Lanham: Rowman and Littlefield. p. 212. ISBN 978-0-7425-6832-7. 1 2 3 Gibbon, Edward (1776). The History of the Decline and Fall of the Roman Empire. p. 174. 1 2 3 Boatwright, Mary Taliaferro; Gargola, Daniel J; Talbert, Richard J. A. (2004). The Romans, from village to empire. Oxford University Press. p. 413. ISBN 0-19-511875-8. 1 2 3 Brauer, G. (1967). The Decadent Emperors: Power and Depravity in Third-Century Rome. p. 75. 1 2 3 Matthew, Christopher (2015). An Invincible Beast: Understanding the Hellenistic Pike Phalanx in Action. Casemate Publishers. p. 403. 1 2 3 Melton, Gordon, J. (2014). Faiths Across Time: 5000 Years of Religious History. p. 338. ↑ Boatwright, Mary Taliaferro; Gargola, Daniel J; Talbert, Richard J. A. (2004). The Romans, from village to empire. Oxford University Press. pp. 413–414. ISBN 0-19-511875-8. 1 2 3 Goldsworthy, Adrian (2009). How Rome fell: death of a superpower. New Haven: Yale University Press. p. 76. ISBN 978-0-300-16426-8. ↑ Dunstan, William (2011). Ancient Rome. Lanham: Rowman and Littlefield. p. 203. ISBN 978-0-7425-6832-7. ↑ Dunstan, William (2011). Ancient Rome. Lanham: Rowman and Littlefield. p. 210. ISBN 978-0-7425-6832-7. ↑ Grant, Michael (1996). The Severans: the Changed Roman Empire. Psychology Press. p. 46. 1 2 3 Tuori, Kaius (2016). "Judge Julia Domna? A Historical Mystery and the Emergence of Imperial Legal Administration". The Journal of Legal History. doi:10.1080/01440365.2016.1191590. ↑ Grant, Michael (1996). The Severans: the Changed Roman Empire. Psychology Press. p. 42. ↑ Gibbon, Edward (1776). The History of the Decline and Fall of the Roman Empire. p. 176. 1 2 3 4 Castex, Jean (2008). Architecture of Italy. Greenwood Press. p. 4. ISBN 0-313-32086-1. ↑ Oetelaar, Taylor (2014). "Reconstructing the Baths of Caracalla". Digital Applications in Archaeology and Cultural Heritage. ↑ Castex, Jean (2008). Architecture of Italy. Greenwood Press. pp. 5–6. ISBN 0-313-32086-1. ↑ Rowan, Clare (2012). Under Divine Auspices: Divine Ideology and the Visualisation of Imperial Power in the Severan Period. Cambridge University Press. pp. 137–139. ISBN 1-107-02012-3. ↑ Rowan, Clare (2012). Under Divine Auspices: Divine Ideology and the Visualisation of Imperial Power in the Severan Period. Cambridge University Press. pp. 142–143. ISBN 1-107-02012-3. ↑ Lim, Richard (2010). The Edinburgh Companion to Ancient Greece and Rome: Late Antiquity. Edinburgh University Press. p. 114. ↑ Hekster, Olivier; Zair, Nicholas (2008). Debates and Documents in Ancient History: Rome and its Empire, AD 193–284. EUP. p. 47. ISBN 978-0-7486-2992-3. ↑ Levine, Lee (1975). Caesarea Under Roman Rule. Brill Archive. p. 195. ISBN 9-004-04013-7. ↑ Benario, Herbert (1954). "The Dediticii of the Constitutio Antoniniana". Transactions and Proceedings of the American Philological Association. 85: 188. doi:10.2307/283475. ↑ Cairns, John (2007). Beyond Dogmatics: Law and Society in the Roman World: Law and Society in the Roman World. Edinburgh University Press. p. 42. ISBN 0-748-63177-1. ↑ Whittock, Martyn John; Whittock, Martyn (1991). The Roman Empire. Heinemann. p. 28. ISBN 0-435-31274-X. ↑ Johnson, Allan; Coleman-Norton, Paul; Bourne, Frank; Pharr, Clyde (1961). Ancient Roman Statutes: A Translation with Introduction, Commentary, Glossary, and Index. The Lawbook Exchange. p. 266. ISBN 1-584-77291-3. ↑ Zoch, Paul (2000). Ancient Rome: An Introductory History. University of Oklahoma Press. p. 91. ISBN 0-806-13287-6. ↑ Lavan, Myles (2016). "The Spread of Roman Citizenship, 14–212 CE: Quantification in the face of high uncertainty". Past and Present (230). 1 2 3 Hekster, Olivier; Zair, Nicholas (2008). Debates and Documents in Ancient History: Rome and its Empire, AD 193–284. EUP. pp. 47–48. ISBN 978-0-7486-2992-3. ↑ Hekster, Olivier; Zair, Nicholas (2004). Debates and Documents in Ancient History: Rome and its Empire, AD 193–284. EUP. p. 48. ISBN 978-0-7486-2992-3. 1 2 Hekster, Olivier; Zair, Nicholas (2008). Debates and Documents in Ancient History: Rome and its Empire, AD 193–284. EUP. pp. 48–49. ISBN 978-0-7486-2992-3. 1 2 Rowan, Clare (2012). Under Divine Auspices: Divine Ideology and the Visualisation of Imperial Power in the Severan Period. Cambridge University Press. p. 127. ISBN 1-107-02012-3. ↑ Hekster, Olivier; Zair, Nicholas (2008). Debates and Documents in Ancient History: Rome and its Empire, AD 193–284. EUP. pp. 49–50. ISBN 978-0-7486-2992-3. ↑ Oman, C. (1916). "The Decline and Fall of the Denarius in the Third Century A.D.". Royal Numismatic Society. ↑ Scott, Andrew (2008). Change and Discontinuity Within the Severan Dynasty: The Case of Macrinus. Rutgers. pp. 130–131. ISBN 0-549-89041-6. 1 2 Scott, Andrew (2008). Change and Discontinuity Within the Severan Dynasty: The Case of Macrinus. Rutgers. p. 123. ISBN 0-549-89041-6. ↑ Scott, Andrew (2008). Change and Discontinuity Within the Severan Dynasty: The Case of Macrinus. Rutgers. pp. 123, 139. ISBN 0-549-89041-6. 1 2 3 4 5 Dunstan, William, E. (2011). Ancient Rome. Lanham: Rowman and Littlefield. p. 213. ISBN 978-0-7425-6832-7. 1 2 Gibbon, Edward (1776). The History of the Decline and Fall of the Roman Empire. p. 177. ↑ Goldsworthy, Adrian (2009). How Rome Fell: death of a superpower. New Haven: Yale University Press. p. 75. ISBN 978-0-300-16426-8. ↑ Gibbon, Edward (1776). The History of the Decline and Fall of the Roman Empire. p. 178. ↑ Hekster, Olivier; Zair, Nicholas (2008). Debates and Documents in Ancient History: Rome and its Empire, AD 193–284. EUP. p. 59. ISBN 978-0-7486-2992-3. ↑ Herodian of Antioch. History of the Roman Empire. pp. 4.7.3. ↑ Dio, Cassius (n.d.). Roman History. pp. 78.11.1. ↑ Varner, Eric, R. (2004). Mutilation and transformation: damnatio memoriae and Roman imperial portraiture. Brill Academic. p. 169. ISBN 90-04-13577-4. 1 2 Pangerl, Andreas (2013). Porträttypen des Caracalla und des Geta auf Römischen Reichsprägungen - Definition eines neuen Caesartyps des Caracalla und eines neuen Augustustyps des Geta. Archäologisches Korrespondenzblatt des RGZM Mainz 43. pp. 99–116. ↑ Manders, Erika (2012). Impact of Empire: Coining Images of Power: Patterns in the Representation of Roman Emperors on Imperial Coinage, A.D. 193-284. Brill Academic. p. 251. ↑ Manders, Erika (2012). Impact of Empire: Coining Images of Power: Patterns in the Representation of Roman Emperors on Imperial Coinage, A.D. 193-284. Brill Academic. pp. 251–252. ↑ Varner, Eric (2004). Mutilation and transformation: damnatio memoriae and Roman imperial portraiture. Brill Academic. p. 184. ISBN 90-04-13577-4. 1 2 3 4 Manders, Erika (2012). Impact of Empire: Coining Images of Power: Patterns in the Representation of Roman Emperors on Imperial Coinage, A.D. 193-284. Brill Academic. p. 226. ISBN 978-90-04-18970-6. 1 2 Manders, Erika (2012). Impact of Empire: Coining Images of Power: Patterns in the Representation of Roman Emperors in Imperial Coinage, A.D. 193-284. Brill Academic. p. 227. ISBN 978-90-04-18970-6. ↑ Tuck, Steven L. (2014). A History of Roman Art. Wiley-Blackwell. p. 28. ISBN 978-1-4443-3026-7. 1 2 Mehl, Andreas (2011). Roman Historiography. John Wiley & Sons. p. 171. ↑ Breisach, Ernst (2008). Historiography: Ancient, Medieval, and Modern, Third Edition. University of Chicago Press. p. 75. ISBN 0-226-07284-3. ↑ Hadas, Moses (2013). History of Latin Literature. Columbia University Press. p. 355. ISBN 0-231-51487-5. ↑ Leistner, M. W. L. (1966). The Greater Roman Historians. University of California Press. p. 180. ↑ Schäfer, Peter (2003). The Bar Kokhba War Reconsidered: New Perspectives on the Second Jewish Revolt Against Rome. Mohr Siebeck. p. 55. ISBN 3-161-48076-7. ↑ Scott, Andrew G. (2015). Cassius Dio, Caracalla, and the Senate. De Gruyter Publishers. p. 157. 1 2 3 4 Rowan, Clare (2012). Under Divine Auspices: Divine Ideology and the Visualisation of Imperial Power in the Severan Period. Cambridge University Press. p. 113. ↑ Rowan, Clare (2012). Under Divine Auspices: Divine Ideology and the Visualisation of Imperial Power in the Severan Period. Cambridge University Press. p. 114. ↑ Wood, Susan (2010). "Caracalla and the French Revolution: A Roman tyrant in eighteenth-century iconography". Memoirs of the American Academy in Rome. 1 2 Sillar, Shamus (2001). Quinquennium in provinciis: Caracalla and Imperial Administration 212–217. pp. iii. ↑ Agnew, John; Bidwell, Walter (1844). The Eclectic Magazine: Foreign Literature, Volume 2. Leavitt, Throw and Company. p. 217. ↑ Magie, David (1950). Roman Rule in Asia Minor. Princeton University Press. p. 683. ↑ Sillar, Shamus (2001). Quinquennium in provinciis: Caracalla and Imperial Administration 212–217. p. 127. ↑ Sillar, Shamus (2001). Quinquennium in provinciis: Caracalla and Imperial Administration 212–217. pp. 46–47. ↑ Asante, Molefi K.; Ismail, Shaza (2016). "Interrogating the African Roman Emperor Caracalla: Claiming and Reclaiming an African Leader". Journal of Black Studies. doi:10.1177/0021934715611376. Agnew, John, Bidwell, Walter (1844). The Eclectic Magazine: Foreign Literature, Volume 2. Leavitt, Throw and Company. Asante, Molefi K., Shaza, Ismail (2016). "Interrogating the African Roman Emperor Caracalla: Claiming and Reclaiming an African Leader". Journal of Black Studies. doi:10.1177/0021934715611376. Baynes, Thomas Spencer, ed. (1878), "Marcus Aurelius Antoninus Caracalla", Encyclopædia Britannica, 9th ed., Vol. V, New York: Charles Scribner's Sons, p. 81 . Boatwright, Mary Taliaferro; Gargola, Daniel, J; Talbert, Richard J.A (2004). The Romans, from village to empire. Oxford University Press. ISBN 0-19-511875-8. Brauer, G (1967). The Decadent Emperors: Power and Depravity in Third-Century Rome. Castex, Jean (2008). Architecture of Italy. Greenwood Press. ISBN 0-313-32086-1. Dunstan, William (2011). Ancient Rome. Lanham: Rowman & Littlefield. ISBN 978-0-7425-6832-7. Gagarin, Michael (2009). Ancient Greece and Rome. Oxford University Press. Goldsworthy, Adrian (2009). How Rome fell : death of a superpower. New Haven: Yale University Press. ISBN 978-0-300-16426-8. Grant, Michael (1996). The Severans: the Changed Roman Empire. Psychology Press. Hekster, Olivier; Zair, Nicholas (2008). Debates and Documents in Ancient History: Rome and its Empire. EUP. ISBN 978-0-7486-2992-3. Lavan, Myles (2016). "The Spread of Roman Citizenship, 14–212 CE: Quantification in the Face of High Uncertainty". Past and Present. doi:10.1093/pastj/gtv043. Lim, Richard (2010). The Edinburgh Companion to Ancient Rome and Greece: Late Antiquity. Edinburgh University Press. Magie, David (1950). Roman Rule in Asia Minor. Princeton University Press. Manders, Erika (2012). Impact of Empire: Coining Images of Power: Patterns in the Representation of Roman Emperors on Imperial Coinage, A.D. 193–284. Brill Academic. ISBN 978-90-04-18970-6. Matthew, Christopher (2015). An Invincible Beast: Understanding the Hellenistic Pike Phalanx in Action. Casemate Publishers. Mehl, Andres (2011). Roman Historiography. John Wiley & Sons. Melton, Gordon, J. (2014). Faiths Across Time: 5000 Years of Religious History. Oman, C (1916). The Decline and Fall of the Denarius in the Third Century A.D. Royal Numismatic Society. Oetelaar, Taylor (2014). "Reconstructing the Baths of Caracalla". Digital Applications in Archaeology and Cultural History. Pangerl, Andreas (2013). Porträttypen des Caracalla und des Geta auf Römischen Reichsprägungen - Definition eines neuen Caesartyps des Caracalla und eines neuen Augustustyps des Geta. RGZM Mainz. Rowan, Clare (2012). Under Divine Auspices: Divine Ideology and the Visualisation of Imperial Power in the Severan Period. Cambridge University Press. Scott, Andrew (2008). Change and Discontinuity Within the Severan Dynasty: The Case of Macrinus. Rutgers. ISBN 0-549-89041-6. OCLC 430652279. Scott, Andrew G. (2015). Cassius Dio, Caracalla and the Senate. De Gruyters. Sillar, Shamus (2001). Quinquennium in provinciis: Caracalla and Imperial Administration 212–217. Tuck, Steven L. (2014). A History of Roman Art. Wiley-Blackwell. ISBN 978-1-4443-3026-7. Tuori, Kaius (2016). "Judge Julia Domna? A Historical Mystery and the Emergence of Imperial Legal Administration". The Journal of Legal History. doi:10.1080/01440365.2016.1191590. Wood, Susan (2010). "Caracalla and the French Revolution: A Roman tyrant in eighteenth-century iconography". Memoirs of the American Academy in Rome. Aurelius Victor, Epitome de Caesaribus 21 (translation). For information on the caracallus garment, see William Smith Dictionary of Greek and Roman Antiquities: "Caracalla"